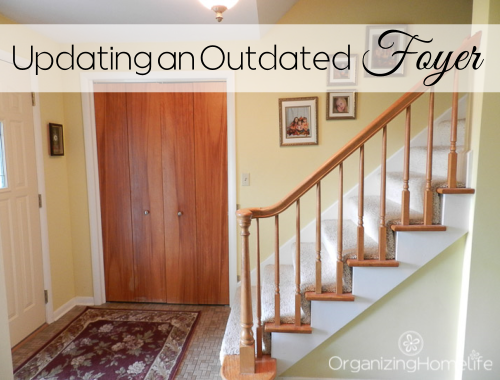 Since moving into this home, one thing I have been waiting anxiously for is renovating our front hall foyer. 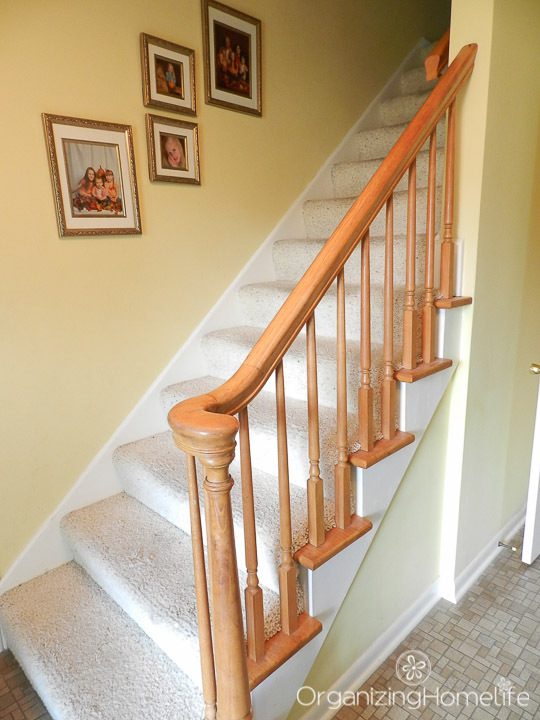 When we bought our home, it was in excellent condition structurally but stuck in the 1960’s and 1970’s decor-wise. It’s been a long process of updating in between work schedules and life. Even with the bright yellow paint, it was a gloomy space. Without opening the front doors, it is just dark. 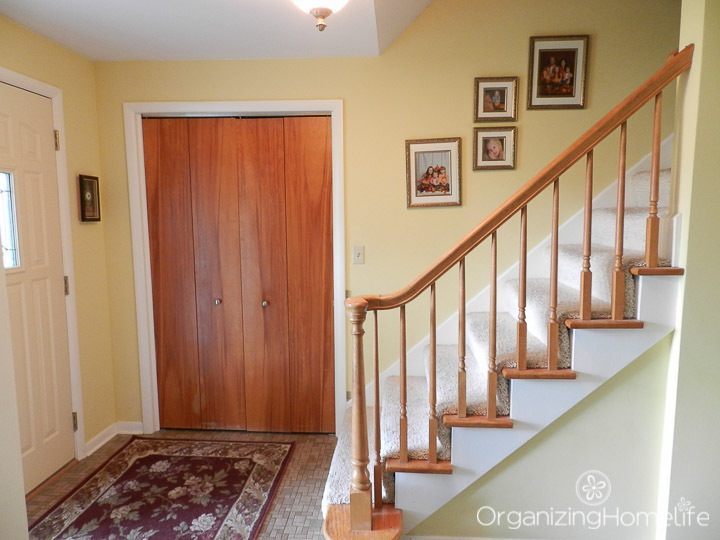 The flat-panel closet doors, honey oak railing, brass door knobs, and floor tile were screaming to be updated, not to mention the old carpet on the steps. We lived with this for eight years while we worked on updating other areas of the house, and I was SO ready to get started! This light might not look too bad, but it added a brownish/yellow glow to the already dreary yellow lighting. 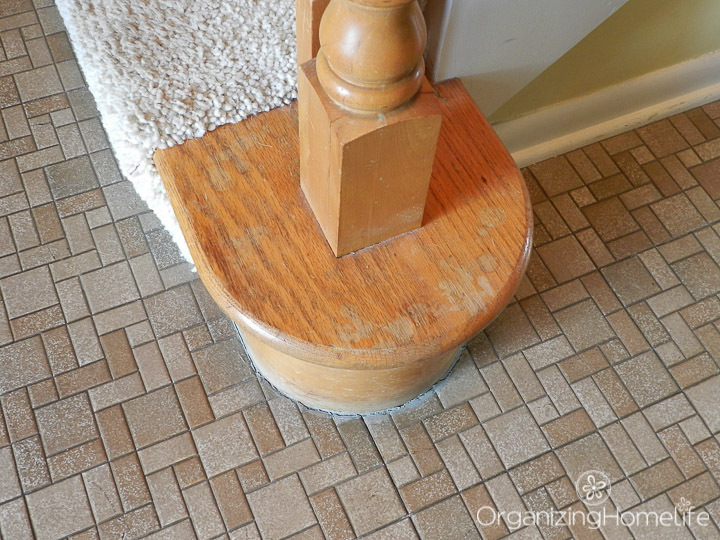 And this picture does a LOT of justice to the worn out carpet on the steps. I’m pretty sure it’s at least 30 years old. 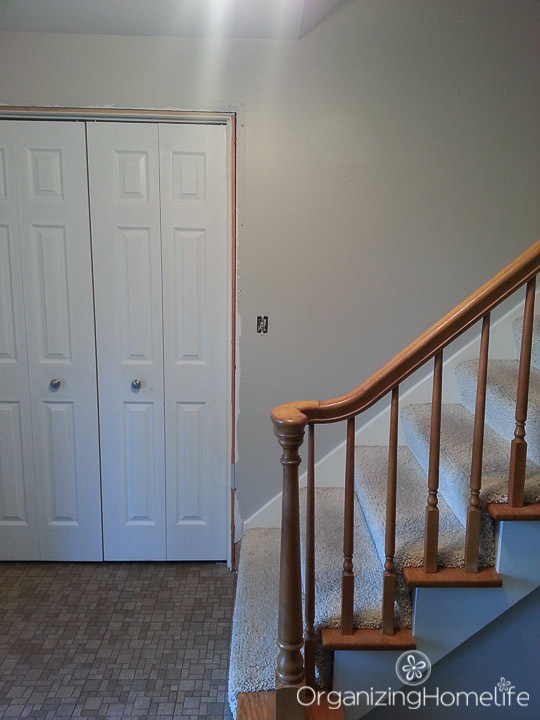 We started by replacing the closet doors since that was a simple job. We decided to match the pattern of the front doors since we’re not planning to replace them. Then we replaced the light and painted. But we ran into our first issue. I spend a lot of time when choosing paint colors and try to get paint samples whenever possible to save myself from costly mistakes. Unfortunately, I wasn’t able to get a sample and the paint color turned out as blue as a baby’s nursery (notice the lower triangle below the stairs). It was supposed to be gray. Fail #1. So I searched Pinterest and found Agreeable Gray by Sherwin Williams to be a popular and beautiful choice. We painted a second time. Fail #2. I don’t know if it was the lighting in the foyer or partly the “blue” gray showing through, but it was still so blue. I lived with it for a while and finally decided I just couldn’t do powder blue any more. 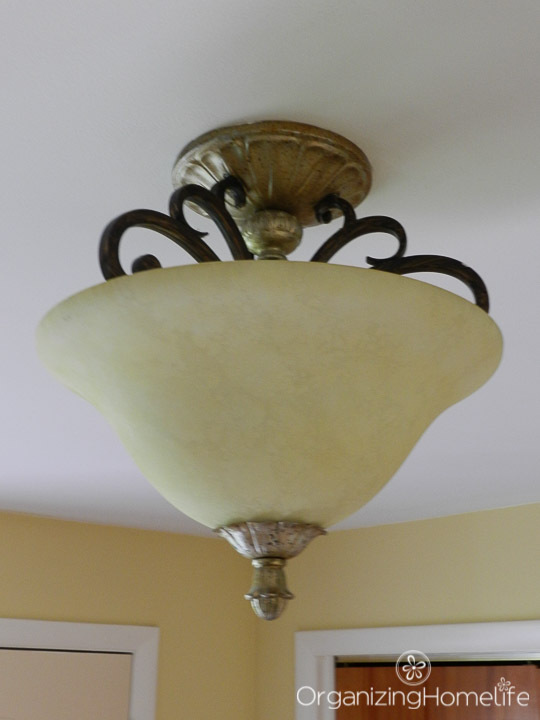 So we went to Benjamin Moore and chose Revere Pewter, another favorite on Pinterest. What I neglected to realize until after repainting the entire stairwell was that those two colors are almost exactly the same color – just different brands. #smh However, it does look a LOT less blue. 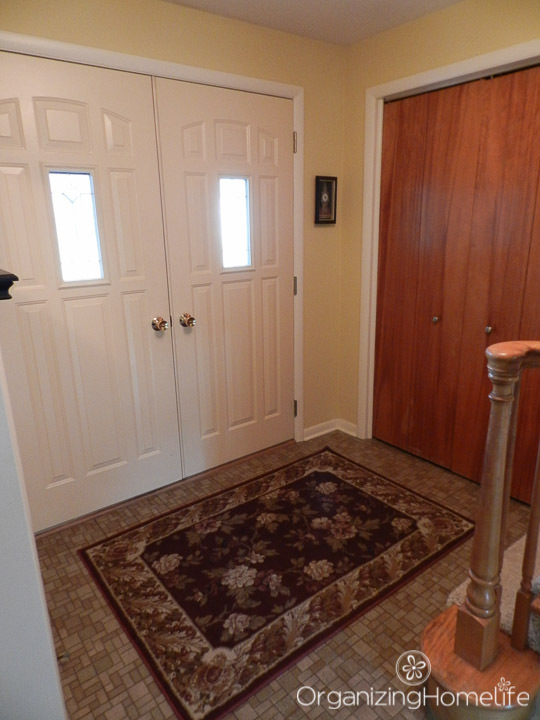 I guess the bottom line is I really like the color, just not with the foyer in its present state. I decided three coats of paint was enough (plus my husband only has so much patience ;)). We also looked at new flooring choices so it could be ordered and ready when we were. I went to a local flooring shop and looked at many samples. 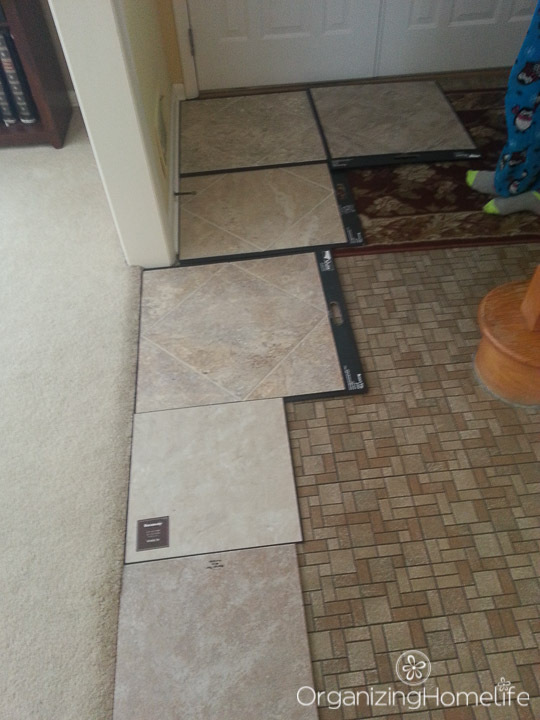 Since I wanted the floor to be neutral and light, my decision was more about material than color. 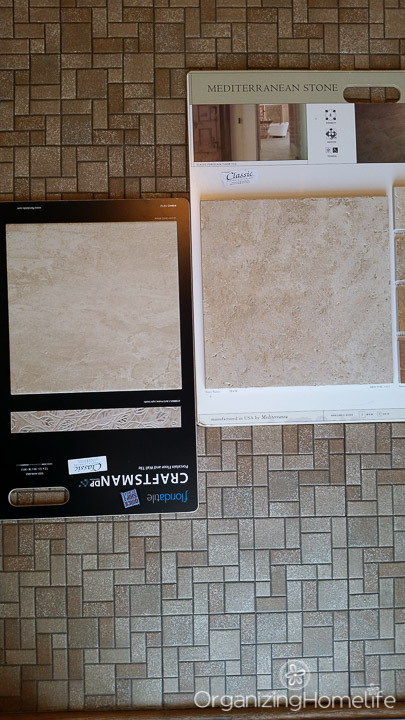 I finally decided on the Mediterranean Stone (on the right). 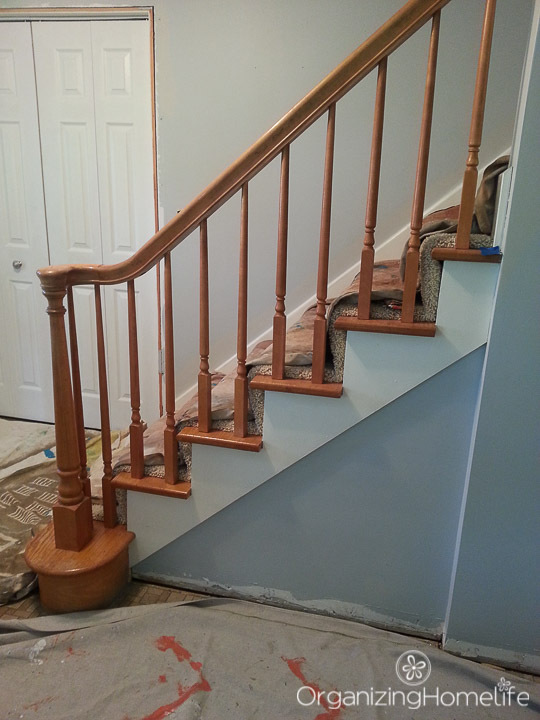 Next up is ripping out the carpet and refinishing the stairs!! Woot! Can’t wait to show you the progress. Many grays are of the blue variety. Maybe picking a brownish gray would work better. That’s like when I was growing up and the older ladies put a tint on their white hair. I would call it blue and my mom would always correct me by saying it was gray. But it didn’t look gray to me! !